This is a new spin on the classic tulip design. The original "square" version is still available in 4"x4" and 6"x6" sizes. 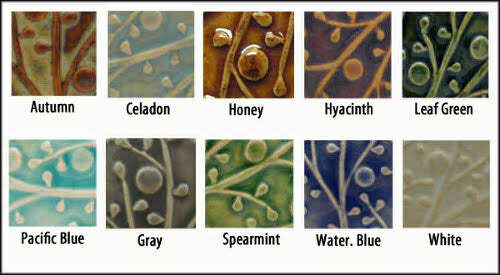 Available in a choice of glazes; all glazes are non-toxic and lead free. Has slot on back for easy wall hanging; also works well for permanent installation in a variety of settings. Arts and Crafts style 3-D relief design. High fired ceramics.